Using our Tutorial on How to Create Immersive Panoramas in Google Earth we have placed online a panoramic view of Trafalgar Square, London. Within the file are two viewpoints – Nelsons Column and the National Gallery, click each viewpoint to fly around the panorama and view the scenes full screen. 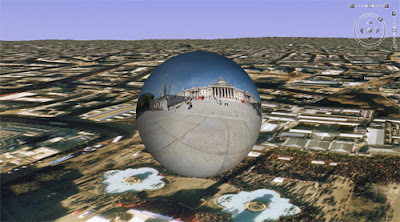 Download the Google Earth Trafalgar Square Panorama (kmz). This is brilliant. Having fun playing with it. My panos don’t have bases so I just drop the alt. a bit and they make sense. One question. How do you align them North/South so that the image is in line with the map. Can you do this in the dae file or do you have to change the image?